Before I launch into my philosophical and musical musings, here's the rain report: since the last newsletter, we’ve had 76 mm or just over 3 inches of rain, transforming not just the landscape, but my internal state as well. January rainfall was slightly over the long-term average. Hooray! 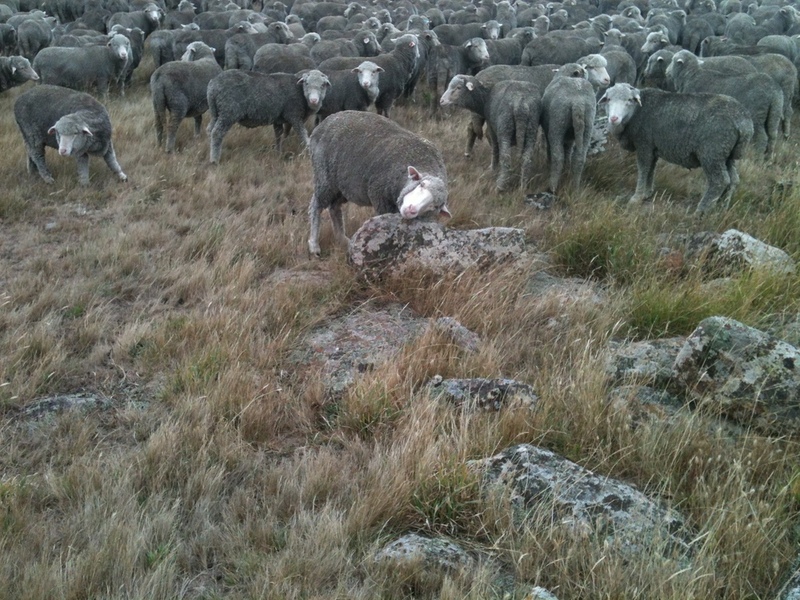 With the new growth and also the protection that shepherding has provided to the main paddocks, I’m reasonably confident I won’t have to sell sheep this year. And, we just had another 17 mm (3/4 inch) a few days ago! On the yarn front, I've just received the shipment of boucle. This is very special stuff, made almost completely from the 14.8 micron hogget wool, since the 17 micron ewe wool had problems with tensile strength. 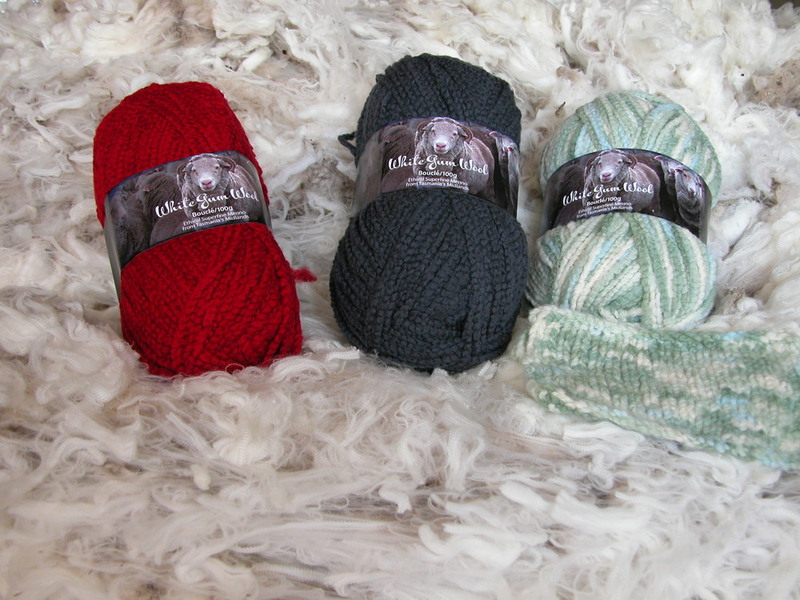 Three new boucle colours have been added to the palette: Hawthorn, Quarrystone, and a new multi-coloured yarn called Silver Tussock, designed for WGW by Rebecca Robinson and dyed commercially by Design Spun. I'm so excited about this collaboration with Rebecca (Augustbird), and delighted with the design she created. I hope you will like it, too! Welcome, too, to my new subscribers. If you want to know why I got started shepherding, take a look at earlier Yarns: You Don't Have to Be Perfect, The Power of the Matriarch and The Zen of Shepherding. Also, please note: most of the images in the Yarns are "clickable" if you want to see more detail, and anything underlined can also be clicked to get to the link. I continue to be indebted to Michel Meuret, co-author with Fred Provenza of The Art and Science of Shepherding: Tapping the Wisdom of French Herders, for his generosity in sharing the collective wisdom of professional French herders, and for setting me back on track when my lack of experience derails me. Marie Labreveux leading her flock in the southern Alps, with her dog Patoune, her “faithful, loyal, staunch” companion for 14 years. Patoune’s mother was a Pyrenean shepherd, her father a little “curious and smiley” dog. Patoune died last December and is greatly missed. Photo copyright M. Meuret. Used with permission. Anthony Navon leading his flock with his dog Zumai in Vaucluse, Provence. Photo copyright M. Meuret. Used with permission. Until I can lead (or more accurately, until they are willing to follow me anywhere in the paddock), I can’t move to the next stage of shepherding: sequencing the order of the “meals” I offer them through the day. Sequencing requires a level of precision in positioning the flock I find hard to achieve when I'm pushing 1000 sheep from behind. 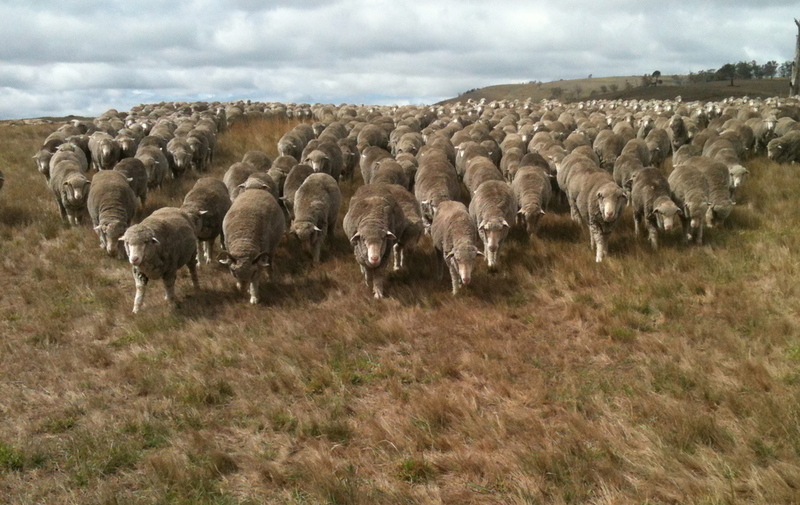 Sequencing is important in maximising nutrition in a diverse environment—more on this in future Yarns. At the moment, I can usually get the flock to follow me through a gate, especially if we are going into fresh forage. After considerable struggle, I’ve finally got my dogs, Chance and Janie, to lie down and stay put well back from the flock at a gate, so I can move to the front without the dogs disrupting things. While Old Leader (aka HRH) won’t deign to follow me, there are perhaps 30 sheep who now will follow me (to HRH’s obvious annoyance). Some of my followers are pets, most aren’t. They seem to have simply associated my presence at a gate as indication of better grazing ahead. However, it’s critical for “my” followers to get to the head of the queue at the gate—not trivial if they are toward the back, and the flock is bunched up. I’ve learned to walk into the flock from my position at the back, giving my followers the chance to see me and to fall in behind as I walk slowly toward the gate. It finally dawned on me HRH does the same thing: she’s not just the anointed leader charging into the sunset—she has her own cadre, and without them, she doesn’t have enough critical mass to move the flock. HRH (Old Leader) just after coming through a gate. The young sheep next to her is one she seems to have adopted. Prince of Wales? Which, of course, brings me to muse on the essence of leadership. What makes a leader, in the true sense of the idea? Are leaders only defined by who is willing to follow them? And what makes the followers choose? In the flock, there are leaders for different things. HRH seems to be the leader for avoiding danger—she is the one who (unless I get in her way) checks for lions in the long grass on the other side of a gate. She also establishes the mid-day rest location for the flock. How did she come to have those roles? Who will take them on after she is gone? Others seem to be the leaders in exploring new forage areas (HRH is lousy at this, by the way), while still others seem to be particularly tuned in to where the water points are. Ahhhh. Just the right rock to get that itch. Same ewe, different rock. She’s the only one I’ve seen do this. Now, here is another embarrassing confession. After 14 years as a woolgrower, I recently realised I didn’t understand the rumination requirements of my ruminants, nor the distinction between rest and rumination. Doh. To be fair, if your flock is in paddocks, you might only notice sometimes they are more difficult to move, and not be aware of them ruminating. But if you are shepherding, it’s critical. It FINALLY got through to me that I was often trying to move them while they were stubbornly trying to get a chance to ruminate and digest what they’d been eating for the previous couple of hours! I was looking at them, but I wasn’t seeing. The flock settling into their “coil” for mid-day rest on a warm day. They look for a place with good air circulation, not too steep, and preferably with short grass or flat rocks. Circulating air reduces the body heat generated during rumination, and also discourages flies. 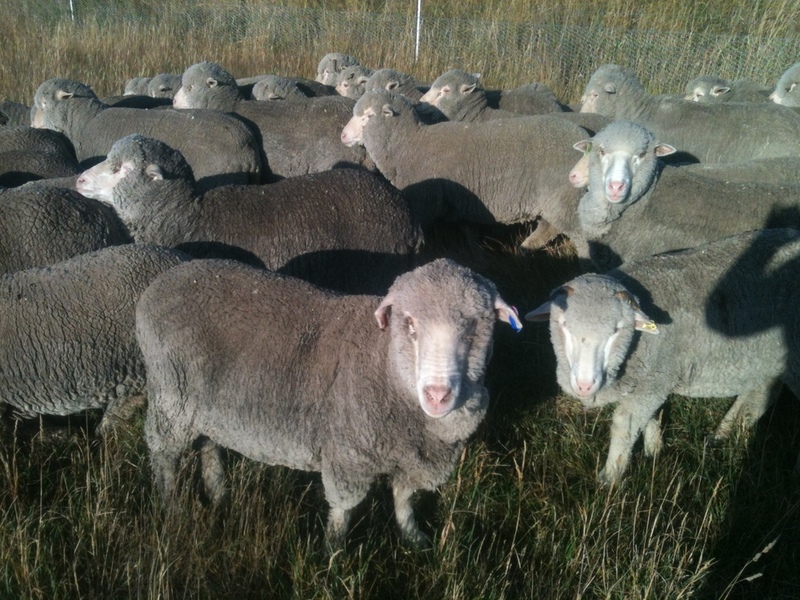 Shade is a secondary consideration for the sheep–they won’t choose shade if the other criteria aren’t met. All of which I didn’t know. Factoring rumination, rest, and response to mid-day heat in summer into the shepherding equation, along with all the variables and subtleties of flock dynamics when they are actually eating, is what put me in mind of jazz: great shepherds, must, like great jazz musicians, be first of all masters of the basic elements of their craft, and then able to improvise, taking advantage of opportunities for creative harmony as they arise. The more I learn about professional shepherds, the greater is my awe at their broad and deep internalised knowledge and their ability to weave the disparate elements of their world into an effective improvisation on behalf of the flock—day after day. What a face! A curious ewe (not a pet) checking out me and the dogs, sitting just a few feet in front of her during mid-day rest. Her ears are relaxed, so she isn’t afraid, only curious. This is how we want all the sheep to feel about us! 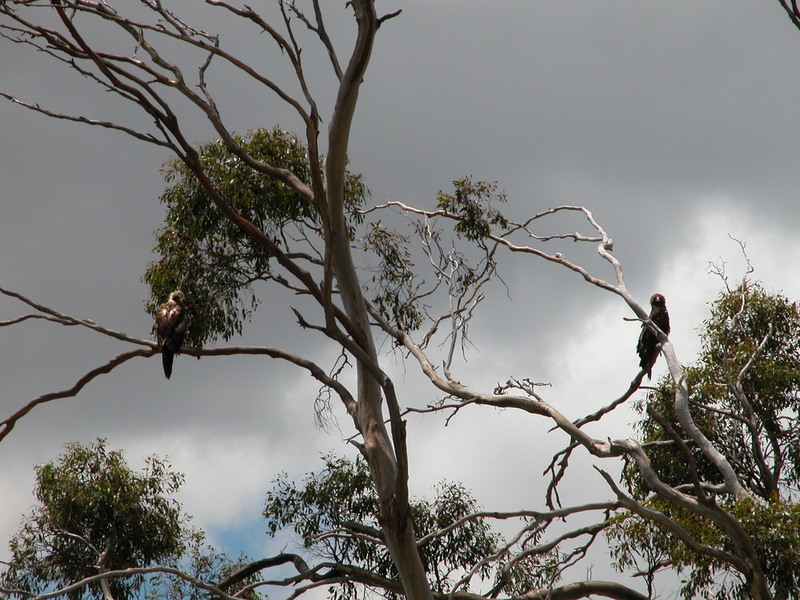 …and a pair of wedge-tailed eagles watching over us the same rest time. Actually, they were mostly waiting for a gust of wind to ride out over the countryside.